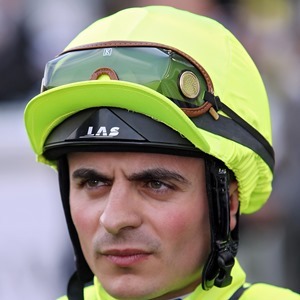 Andrea Atzeni chalked up seven QIPCO British Champions Series wins in 2015 and 2016, and got off the mark for 2017 when guiding Stradivarius to success in the Group 1 Qatar Goodwood Cup. He hails from the Mediterranean island of Sardinia and has no history of racing in his family – his father is a farmer and his mother a dentist. Nevertheless, he has lived for riding from a very early age and cut his teeth in Sardinia’s own very rustic version of pony racing. He emigrated to mainland Italy to start work for Milan trainer Alduino Botti at the age of 15 and two years later moved to England to join the stable of Botti’s son, Marco. His first taste of big race victory came aboard Darley Sun in the 2009 Cesarewitch Handicap but he had to wait until 2012 to enjoy his initial Group 1 success, on the German-trained Sortilege in the Premio Lydia Tesio in Rome. 2013 proved his real breakthrough year, as he became stable jockey to Newmarket trainer Roger Varian and cemented this new partnership with his first British Group 1 win, aboard Kingston Hill in the Racing Post Trophy. His annual tally of 120 winners more than doubled his previous best and was beaten by just seven jockeys across the nation. He rode Tac de Boistron into second place in the Sky Bet Yorkshire Cup, was third on Ambivalent in the Investec Coronation Cup and then second on Kingston Hill in the Investec Derby behind hot favourite Australia. He was also third on Euro Charline in the Coronation Stakes at Royal Ascot. He had his glory when Kingston Hill landed the Ladbrokes St Leger, his first British Classic winner. In 2015, he renewed acquaintances with Luca Cumani’s Postponed and the pair teamed up to land the King George VI and Queen Elizabeth Stakes at Ascot by a nose. Atzeni continued his fine form in the QIPCO British Champions Series when partnering Pallasator to victory in the Doncaster Cup, and then Simple Verse in the St Leger and QIPCO British Champions Fillies & Mares Stakes on British Champions Day.